Top 5 Tips for Improving Your NPS Score – Strategex, Inc.
Just over a decade since its introduction, NPS (Net Promoter Score) is now widely recognized in the market. Everyone who’s anyone in business leadership seems to be measuring NPS and discussing it routinely on blogs, in boardrooms, and at conferences around the world. And finally, the conversation is evolving — from simply measuring one’s score to actually doing something about it. NPS cheerleaders are increasingly focused on what it takes to raise their scores. They’re also asking how to benchmark, set targets, and monitor improvements. Strategex has been incorporating NPS into our Voice of the Customer Research since the beginning — with a unique focus on Continuous Improvement processes — and we’re here to help answer those questions. Setting an NPS improvement target: what should it be? Almost everyone we meet grapples with this question: how should we set our annual targets for NPS improvement? The short answer is that appropriate targets differ by your market and current position, so there’s no easy answer. Our focus over the past 20 years has been on helping B2B companies grow and improve, so I can suggest several factors to consider if you’re selling products or services to other businesses. First, don’t use percentage improvements. It’s imperative you set a target based on improving your absolute score. A target based on a percentage increase is meaningless: for example, if you targeted a 20% increase on an underwhelming 15% NPS baseline, you would only rise to an 18% NPS — both a negligible improvement and a lackluster indicator of customer loyalty! A simple rule of thumb — purely as a starting point for consideration — would be an absolute 10–15 percentage point improvement. That would be a solid year-over-year gain. In our previous example, moving from that 15% NPS (basically a “C”) up to a 25% or 30% score (roughly a “B”) the following year would be quite respectable. But before locking onto a specific target, you must first consider your current score. 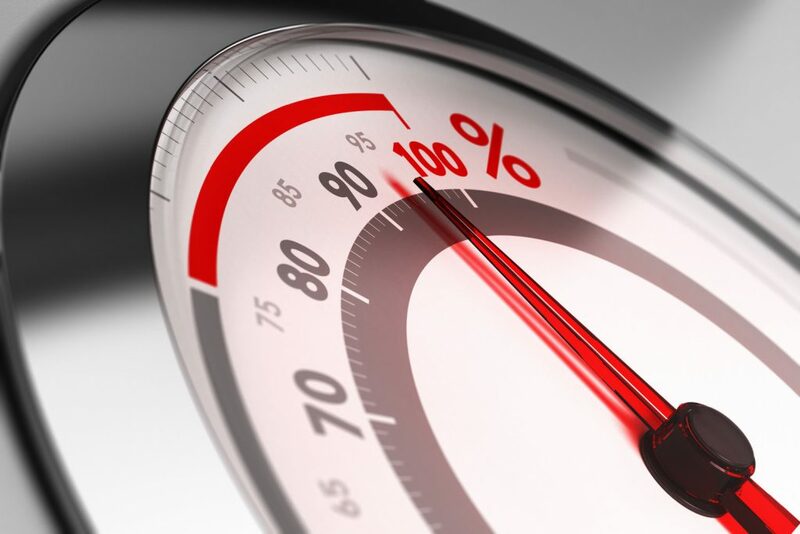 If your current score is low — say, a single digit or even a negative score — set a more aggressive target such as a 15–20 percentage point improvement. Why? Low NPS scores indicate that major problems exist in your business — issues that must be addressed with both urgency and focus. If you address these problems and customers see the improvements, your scores will inevitably shoot up. We’ve had several engagements in which we helped clients achieved a 25-point improvement from a low baseline score. If your current NPS is average-to-good (in the 15–40% range), a 10-point improvement target is probably more reasonable. Scores in that range indicate your company is doing many things well. But 15–40% is far from perfect — clearly, you still have some problematic areas to resolve — so challenge your organization to strive for a better score. A 10-point gain is quite doable for any company committed to its customers. Over the years, we’ve seen several clients bump up 15-20 points starting from this average-to-good baseline range. If your company is fortunate enough to score over a 50% NPS, you can relax a little. Set your target for either a modest gain (say, 5 percentage points) or simply staying level for the coming year. That might sound too easy, but maintaining a high score is anything but. We’ve seen far too many companies hit a high score one year, slip into resting on their laurels, and then have their NPS scores drop the following year. That’s both sad and unacceptable. Now you have your NPS improvement target. How do you hit it? We’ve seen a myriad of approaches to raising scores, and have tested many in our consulting practice. Here are five approaches we strongly recommend if you want to maximize your efforts. Once the survey results are in, it’s essential that you thank your customers for taking the time to participate. Show each participant that you not only care about her or his opinions and feedback, but that you are grateful each took the time to provide meaningful input. And do it the old-fashioned way: a personalized letter, hand-signed and mailed in a hand-stamped envelope, will go a long way! Too many companies send generic spam-like thank-yous these days. Make yours stand out from the rest. 2. Engage your customer — personally. Your account managers should personally reach out to their key accounts to discuss the survey results, with a specific focus on that customer’s input if it’s available. The key here is to impress upon your customer that you’re really listening and you’re committed to improving. Have your account managers make it abundantly clear that you’re committed to being a better provider — and partner — in the future. Make sure all of your employees know your company’s NPS results. It’s critical that they understand why NPS is so important, what the company’s score is, and what needs to be done to improve going forward. The key is to raise awareness of the challenge ahead and make each team member feel personally responsible for helping to improve NPS for the organization. Those three tips are the basics — relatively easy to implement and sure to provide some measurable gains. The next two items are a bit more challenging, but they are truly key to a more significant success. Your management team must take a very deep dive into the customer feedback. Identify the top three or four most common complaints, both among your detractors (NPS of 6 and below) and the passives (7s and 8s). With the recurring complaints identified and the matching customer comments in hand, conduct a root cause analysis. Group the common themes into improvement categories (e.g., “speed up initial responses,” “clarify service agreement options”). Then prioritize those issues based on frequency of mention. Once complete, you should have a Pareto chart that clearly defines in priority order the top issues that need to be addressed. Again — and this can’t be emphasized enough — be sure to review the feedback not only from the angry customers (“the detractors”) but also “the passives” (customers who like you but don’t love you). You’ll most likely find that your improvement themes have a high overlap between the two groups. And that means prioritizing those particular areas of improvements will lift both boats — significantly improving your overall NPS. With the improvement categories identified, identify who “owns” each problem. It should be pretty clear who’s responsible for each. Then define action plans and the appropriate follow-up steps. The key is to focus on these problems first and not allow yourself to be distracted by lesser issues. Fixing the high-complaint areas first will result in significantly improved scores. Conversely, not addressing these complaints with a sense of urgency is a sure-fire way to both underwhelm and disappoint your customer. 5. Make your account managers responsible. The last item may be simpler, but it’s critically important at an account level. Presuming your survey results have been organized customer by customer — rather than simply aggregated into “flat stats” — encourage each account manager to review each of their account’s feedback. Every account manager must identify one or two things they can do personally in response to the critique. Make sure your account managers reassure their customers of their personal commitment to making the necessary improvements. Your account managers should have no reason to panic if they acknowledge problems early on. We often see a lot of low-hanging fruit in survey feedback — issues that can be easily and quickly fixed if addressed quickly and efficiently. Move the needle. It’s not that hard! Make the necessary fixes quickly to prove to customers you’ve not only heard them but that you’ve really listened. If you follow this proven formula, you’ll quickly recognize the power of NPS as a potent tool for improving customer relations and, consequently, growing your business. Tom Taber is a Managing Director at Strategex. He can be reached at ttaber@strategex.com.